The competition for European Cultural Capital 2021 reached the intermediate stage after the short list was announced, with the cities chosen to compete for this title. These cities are Bucharest, Timisoara, Cluj-Napoca and Baia Mare. The announcement was made by the Ministry of Culture. 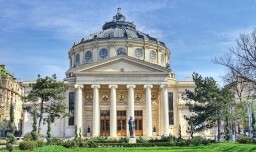 In total, there were fourteen Romanian cities that submitted their candidacies for this title (Alba Iulia, Arad, Bacau, Baia Mare, Brasov, Braila, Bucharest, Cluj-Napoca, Craiova, Iasi, Sfantu Gheorghe, Suceava, Timisoara, Targu Mures). All of them introduced their concepts in front of a jury of 12 international experts and this jury made the selection based on several internationally valid criteria.